Manufacturer & Exporter of Teacher Abacus. Our product range also comprises of Abacus Books, Abacus Study Material and Abacus Bags. Color Yellow beads with black frame. 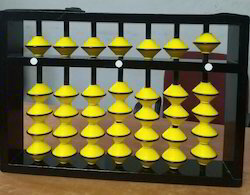 7 Rods Teacher Abacus. Attractive Yellow Beads And Black Wooden Frame.